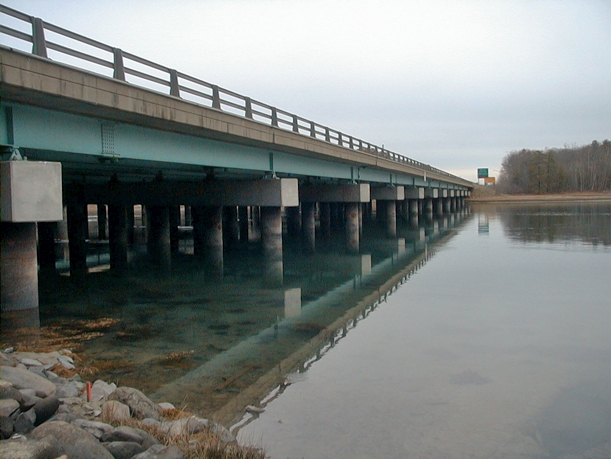 Childs Engineering has provided underwater bridge inspection services to the Maine DOT for over 15 years. The highway bridges inspected include single spans supported on concrete abutments, multiple span bridges on concrete abutments or supported on piles. Childs provides underwater inspections according to NBIS standards including inspection and assessment of the pier structure, examination of the river bottom for scour and providing hydrographic survey services for hydrologic analysis. Childs bridge inspection crews are experienced and familiar with the recording and coding for the SI&A grading system. To inspect the Main Turnpike bridges Childs Engineering mobilized dive crews in remote areas with limited access. Childs also used a verity of boats to support the dive crew as well as to perform hydrographic surveys in shallow waters.